Want to learn how to draw a motorcycle? 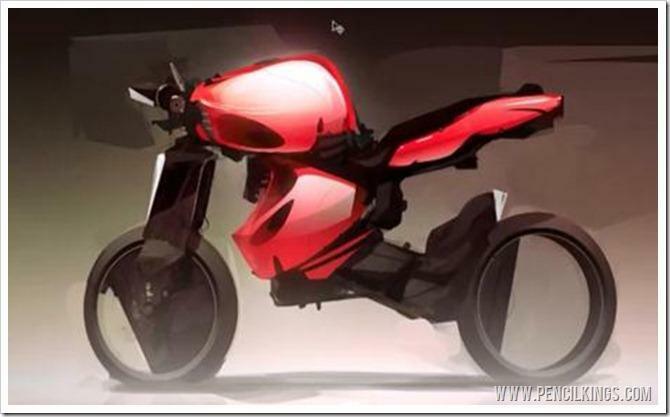 In this series, New Zealand-based vehicle concept designer James Ellis shows you how to create a concept sketch for a motorcycle design using a range of simple, yet professional Photoshop techniques. 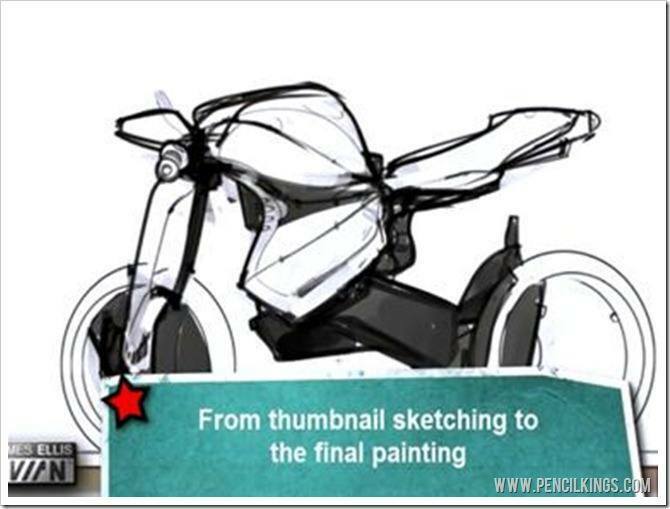 So, if you’ve ever wanted to learn how to draw a motorcycle and design your own super-powered vehicle, now’s your chance to pick up some industry-standard techniques and learn how to go from a loose, thumbnail sketch to a finished concept in less than an hour. During this series, you’ll learn a variety of Photoshop techniques designed to save you time and get great results. So, let’s get into gear, pick up our tablets and get going! If you’re planning to become a vehicle concept designer, it’s important to have a wide range of designs to show your clients. Therefore, we’ll be working quickly to come up with an initial sketch which can then be developed into a rough render. Ideally, you’ll want to have around a dozen sketches like this to show people. To start with, take a look around the internet and motorcycle magazines for inspiration. You’ll see there’s an incredible variety of different bike designs, ranging from more traditional styles to radical space-age creations that look ready for lift-off! Whichever style you choose, you’ll be able to use the skills picked up during this series to create just about any motorcycle design under the sun, so have fun and go wild! 1. Keep your designs nice and loose – these are just initial concepts and you need to have several to show your clients. 2. Look around for inspiration – once you understand the basics of how a motorcycle works, you can let your creativity run free and come up with all kinds of awesome designs. 3. Don’t be too precious about your work – aim to draw quickly and loosely and let your creativity shine! We hope you learned a lot about how to draw a motorcycle in this article. In the next lesson, you’ll learn how a motorcycle works and how it’s constructed. This will give a better understanding of vehicle concept design and enable you to create convincing sketches that will impress your clients. So, let’s get ready to look at the internal workings of a motorcycle and start up the engine ready for some serious sketching!